I am nuts about candles, and I like to keep them burring for a long time, which is scary... but, now there are Flame-less SMART CANDLES. They are available to buy online, or in department stores. For people who love candles, but sometimes forget to put them out, like me, there is no need to worry about burning down the house anymore. 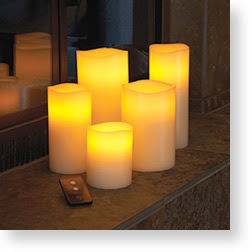 These awesome flame-less smart candles look elegant, and now with new technology, they are rechargeable, yes. By being rechargeable, you don’t have to replace the batteries anymore. It is good for the environment that we do what we can to eliminate what we toss into the dumps. But, I can't wait to tell you about the best part, they come with remote controls for timer too! 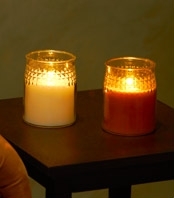 I have been wanting to try the flame-less candles for sometime now, have you heard of them? Imagine if you were to host a big party or a reception with candle lights. The place isn't so safe with all those real wax candles lit, or it would be very warm. However, if you use the flame-less candles then it lowers the risk of faulty incidents... like something catching fire! 1) Have you heard of these Flame-less Smart Candles? 2) Would you consider trying the free trial? Before you link-up: 1) Read the Thursday Two Questions Details Page, 2) Have a link back to Thursday Two Questions, 3) Post your own Thursday Two Questions, 4) Visit at least two participants and answer their questions - that is how you will create a bond and friendship. Links are monitored,&spam will be removed. Thanks for joining us today. I am famous for leaving the candles burning until they spill over the counter. This will be a great change, my DH will be happy to know. I think the remote control is something awesome. I mean, how much more convenient can it get? High tech candles, I love it. I love burning candles but am very afraid of fires because I let them burn down as well. I have never heard of these so I would absolutely like to try them. I love candles, especially the fragrant ones, like Yankee candles but my hubby does not like them and gripes when I light them. Maybe these would work? I hope you don't mind, but I was blog cleaning and revamped a two year old post for TQT and resubmitted it. Maybe. I love Yankee too, they smell the best. But for safety at parties or in the summer time, no heat is best...the flameless is the way to go. Not at all, I will hop on over to visit you soon. Yes. I figure, I can't be the only one that like to let the candles burn. And like you, I am so glad to have learn of the flameless smart candles. We have been using flameless candles now for three years. So far none of the batteries has gone dead. Perhaps next year. We got them on 'After Christmas Sale' at Walgreen's. They were 12 (a dozen) for $2.50 which was half price. I did steal one of the batteries for my calcualtor as they are soooo cheap this way (twenty cents). But I have not heard of the Smart Candles. It would depend on the price what I would pay for them. I would not pay shipping charges for just one for sure unless it was on a card and could be sent for 45 cents. I have heard of flameless candles before. I'm not quite sure, but I do remember seeing them online somewhere. I think I would consider trying these out because I love the look of candles, but we don't like burning "real" candles indoors because the smoke is bad for electronic equipment. Thanks for the heads up and I'll be sure to hop over to the link you provided. PS: While I think this is something I may consider trying one day, I don't think I would go for the free trial offer because of my absent-mindedness and the expense would be enormous for someone such as myself who isn't a regular candle user. But, this may be simply perfect for people who can't live without the ambiance of candle of light in their lives. Great info! No, I haven't heard of flameless smart candles, and I would see if I can get a trial one. Like Jim, I don't like to pay for shipping.. But these seems interesting enough. I love how flameless candles look, but what I would miss is the scent coming off of them. But I do agree, they are so much safer to keep around!